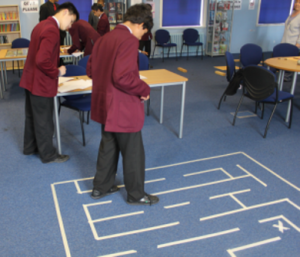 Roamer has been designed for the classroom. Where possible we have integrated it to utilise the typical resources of a school. We do support it with a number of accessories which extend its capability. But how do you use it so that everyone is an active learner and gains a valuable learning experience? What space do you need to run Roamer activities? Roamer’s flexibility provides you lots of options to ensure students enjoy the excitement of learning. A characteristic of projects is the diversity of activities involved. Although Roamer may inspire the project, or be a key ingredient, it is only part of the task. Sometimes a project may require specialist rooms like the art and craft room, or the tech workshop. There is also the possibility of “time sharing” the resources. In the Robotic Performing Arts Project, involved the students in art, design technology, mathematics, video shoots and video editing. Exactly how you would organise this depends on your school set up. Although this takes a deal of effort, the value of project is hard to resist. A number of workstations are set up. Students work in groups and take it in turns, going from one workstation to another. .
One way to use this approach is choose activities for the workstations that deal with the main topics you have taught in recent weeks. It presents students with an exciting way of consolidating what they have learnt and gives you the opportunity to assess the strength of their understanding. Others have used it in After School clubs and other informal learning situations. Situations arise where students who will benefit from personal attention. Special Education is one example. Situations arise in mainstream education where using Roamer to demonstrate a concept or walking a student step-by-step through particular idea can prove effective. This way of using Roamer also applies to work with any student who is struggling to grasp an idea. It does not matter if they are the brightest student in the class, if a practical activity will help them understand something then it serves its purpose. Dr. Carol Samango Sprouse, at the Mayo clinic in Minnesota, is using the Roamer powered Cosmobot in this session with an autistic student. 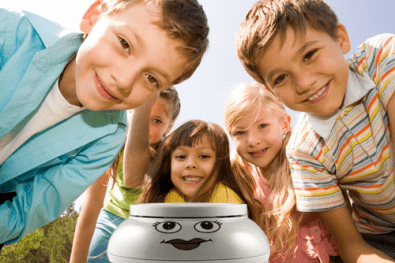 While most teachers would prefer to have a their robots in their classroom, with a little planning you can share the resources throughout the school. Roamer can be an “pet” in an Early Year’s classroom in the morning teaching students how to read and spell. In the afternoon it can be introducing older students to algebra or negative number arithmetic. Roamer’s modularity makes this transformation quick and simple. You can change the behaviour and the graphic for a keypad to make your Roamer sutiable for different activities.